Gerard López’s side weren’t able to come home with any points from an intense game with was influenced by the difficult weather conditions. The blaugranas lost 2-1 in the 24th fixture of Group 3 in Division 2B but they remain top of the table thanks to Alcoyano’s draw. 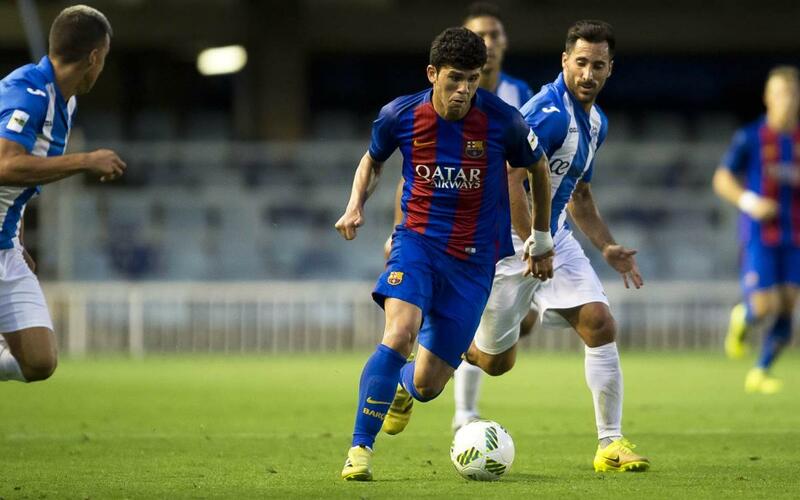 Barça B went into this game without a win in two fixtures having lost 2-0 to Villarreal B and drawn 1-1 with Alcoyano. On the other hand the Balearic side came into the game on a high with two consecutive victories. Gerard López’s team had some fresh faces in it with the U19A left back Cucu making an appearance. The Catalan coach was confident in the quality of his young full back who has made his third start with Barça B and was tidy throughout. The opening moments of the game were marked by Barça’s attacking intensity. Dani Romera and Jesús Alfaro dribbled dangerously near the opposition box and both drew fouls. After this initial period the game moved back and forth and the blaugranas struggled to control the tempo of the match. Atlético Baleares had the wind in their favour in the first half and they made the most of this by putting plenty of crosses into Suárez’s box but they failed to create any clear-cut chances. The away side adapted and as the game went on and they used a more direct style of play. This new approach led to the opening goal as opposition centre back Esteban turned a Gumbau cross into his own net, in the 21st minute. The goal didn’t change the dynamic of the match and neither team was fully in control with both sides having chances. Six minutes after the break, Jurado beat the Barça keeper and put his team back on level terms. The blaugranas responded well and Alfaro led the charge in attack as he tried to put his team back in front. Atlético Baleares didn’t back down either and they looked to take the lead but were thwarted by Suárez’s convincing performance in goal. Xisco bagged the winner ten minutes from full time and following his goal Manu saw a shot saved by Suárez in a move which could have doubled the team from the Balearic Islands lead. The game ended in defeat for Barça B but they remain top of the table as their closest rival, Alcoyano, could only draw their game.